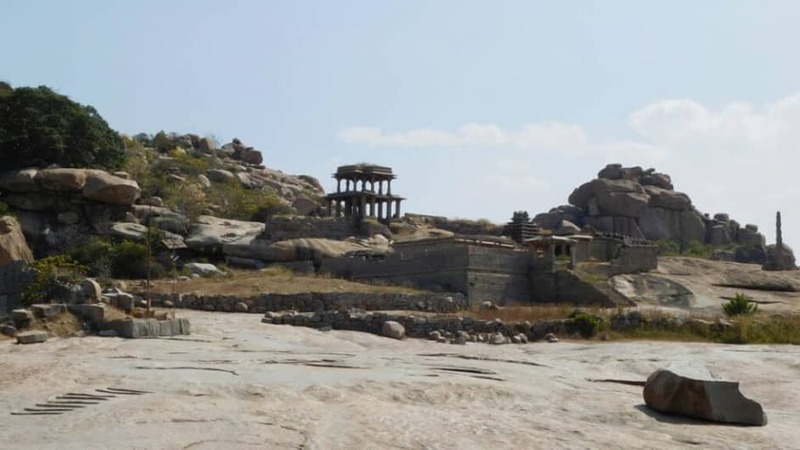 The Lonely Planet describes Hampi as – “A fantasy world of rocks and ruins”. Well, it’s more real than fantasy, a world that was once covered with richness and grandeur, now lies as a devastated beauty. 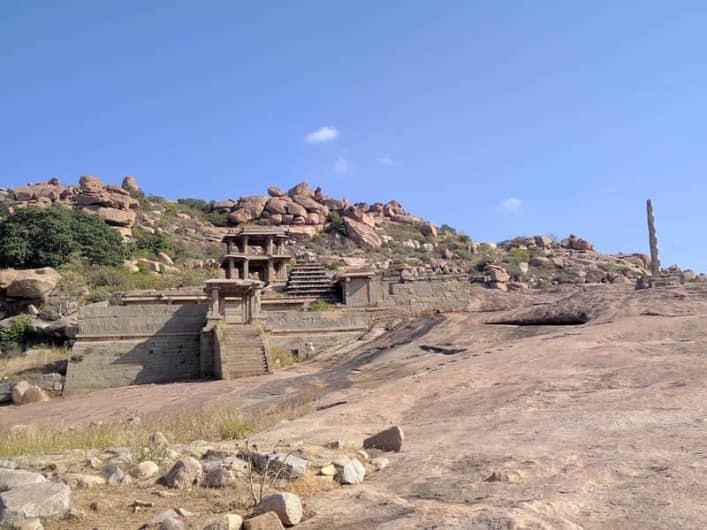 Hampi is one of the World Heritage Sites that has been declared by UNESCO and is located on the banks of the Tungabhadra River. This city has a very rich history as it was one of the largest cities back in its day. It was even the capital of the Vijayanagar Empire. Currently, the city is divided into halves: the hippie island and the heritage sites. So, if you are interested in ancient Indian history and knowing about how the old world worked, this is the place for you to explore. With places such as Vittala Temple and the Virupaksha Temple, your entire curiosity will be well nurtured. You will be surrounded by beautiful structures of architecture that have so many stories hidden within their stone walls. These sites also prove to be great places for taking pictures – thanks to the sheer beauty of all the structures present there. To cater the needs of your adventurous soul, we shall guide you to the hippie island that’s on the other side of the river. 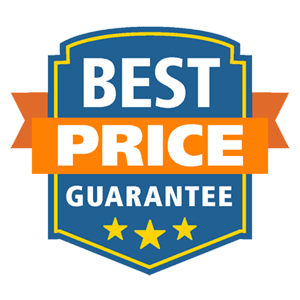 Riding on your moped, you’ll surely have a thrilling experience while exploring the painted walls and the fancy cafes that will completely blow your taste-buds! So join us on a visit to this spectacular place that is going to be a blend of culture, history, panoramic views and a lot of fun! We will be leaving from Bangalore by 10:00 PM and making the 364 kilometre ride all the way to Hampi. After everyone is sufficiently freshened up, we will be making our way to the boulders. 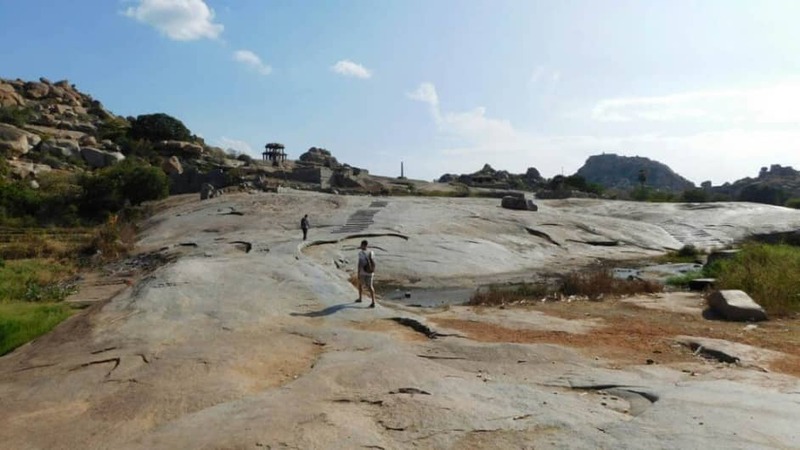 One of the main things that Hampi is known for is bouldering. Bouldering is the process in which one uses their body weight to climb up a rock. If you are scared at the prospective of doing so, don’t be. There are going to be plenty of professionals who will help you navigate the rocks with great ease. Sadly, all this fun can only last for two hours before we move on to something that will be even more fun! Your ride for the day! Mopeds will be available on the site and can be used as a mode of transportation for those who do not want to walk. We will replenish our energy by having lunch and then we will head off to Sanapur Lake. This gorgeous lake is in fact a reservoir of river Tungabadra and is very common for cliff jumping. You can rest your tired legs in the soothing water that the lake houses while enjoying the beautiful scenery all around you. After this brief period of resting, we will be back on our feet and on the way to Anjaneya Hill. Legend has it that Lord Hanuman was born on top of this hill because of which it is also known as Hanuman hill. This hill has a wonderful view of the entire city as it shows both the heritage as well as the island side of the city. We will watch the sun go down from the top of this stunning hill and will then head back for dinner. After everyone has once again replenished their energy, we will go for a late night walk to the rocks. Over here, you can sit down and enjoy the view that will be illuminated by the glowing flames of the campfire. We will rise and shine early in the morning to watch the spectacular sunrise that just cannot be missed. You will observe the gorgeous blend of yellow, orange and blue from the top of the Hemakunta hills. These hills are home to a number of temples dedicated to Lord Shiva. All the history and culture buffs, get ready because your time is here. 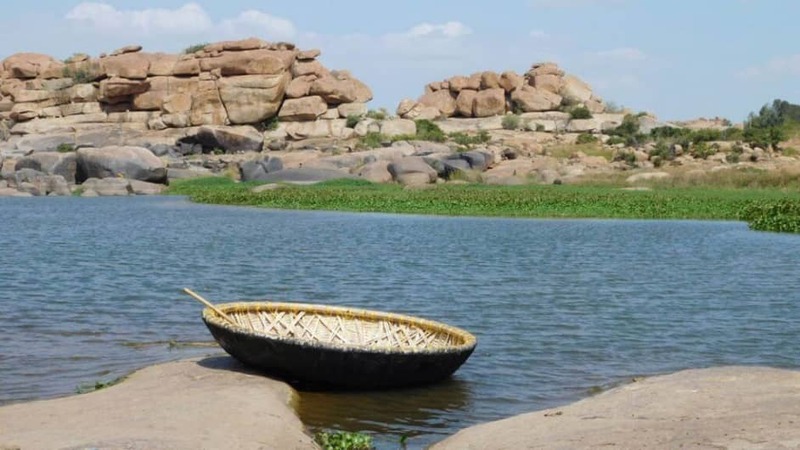 We will take an early morning ferry to the heritage side of Hampi, and you guys are in for a treat! We will first head to the Virupaksha temple which has three stunning entrance towers to it. This temple is dedicated to Shiva, Pampa and Bhuvaneshwari and also has a very serene pavilion situated within the structure. We will then head to the Vitthala temple via Mathanga hills. This temple is house to the legendary Stone Chariot which is the symbol of Karnataka tourism. After a morning filled with absorbing information about the rich culture of this wonderful city, we will be enjoying a ride across the river in a coracle. A coracle is a floating basket or a boat that are made of leather, plastic and bitumen. You can enjoy swaying across the water in these adorable structures while observing the beautiful blue-ness all around you. Sadly we will have to be back by afternoon and start making our way back to Bangalore. Our time with each other might end there, but the endless memories never will.